Hello, I had carpet beetles in my old apt and we cleaned everything and moved. They seem to have moved with us in one of the Sofas and we have a cat. Can I solve this problem? Do I need a new sofa? Doug, are you sure they are carpet beetles? Normally carpet beetles or what are commonly known as Dermistid Beetles only infest natural animal fibers such as rugs, clothes, etc made of wool, etc. They also live on plants outdoors. Lets be for sure that we are talking about Carpet Beetles. Can you send a picture of one? Definitely a Dermestid Beetle Larvae. Whether its a true carpet beetle or not, is hard to determine. How old is the sofa, was it stored for any period of time and how many larvae, adults have you found? We had them all over in our last building but moved (we threw out and dumped alot of clothing) and they got in the couch. We're finding 1 or 2 here and there the new apt and 10-15 in the couch over 2 weeks. We're dumping the couch but can you recommend how we can fight them ? We put a lot of our cloths in plastic to protect them this time and we dont' have carpet. 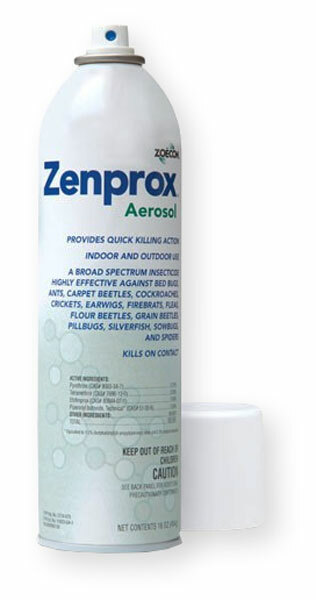 If its only an apartment, then I would recommend to use Zenprox Aerosol. Spray the sofa, turn it upside down, remove the cushions and spray everything. In some cases, you may need to remove the felt lining on the bottom if there is one, then spray up inside the sofa. Zenprox can be sprayed on almost anything. You can also spray the baseboards, floors, etc. We have other products, but for an apartment, you don't need a lot of chemical. I think a couple of cans would probably be very effective. Treat initially, and then in about 3 weeks and see what happens. Might just save the sofa. It's also safe for the cat.